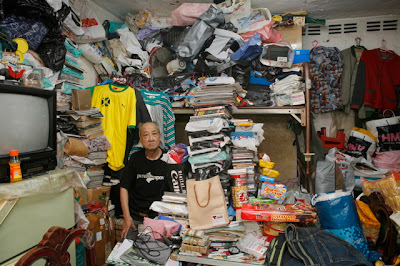 In 1953 in Hong Kong, was a teeming refuge for millions of recent migrants from mainland China. 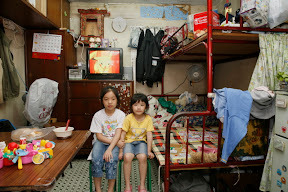 Then on Christmas day, at Shek Kip Mei squatter colony, a fire broke out that made 53,000 people homeless. In the next year, more fires brought the total to 100,000 (1 in 20 of the urban population). 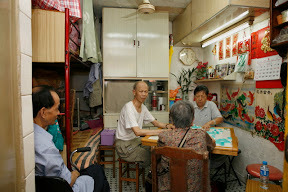 The colonial government quickly launched a housing scheme nearby, and this became the beginning of public housing in Hong Kong, which now houses half of its population. There are still a few blocks left from the 1950’s, called Mark I and II. These H-shaped 6-story buildings have 11 square meter rooms placed back to back on the long arms, with no amenities. The flats have external access corridors where cooking was supposed to be done. Flush latrines, running water, laundry and shower rooms were provided on the cross piece at each level. These cubicles were designed to accommodate 5 people!. 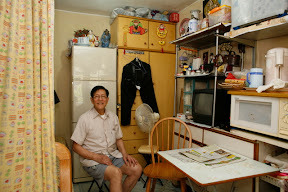 This is an intimate glimpse into the lives of the present day residents of Shek Kip Mei Estate in a series of photographs called "100 x 100" by Michael Wolf. You can see all his 100 photographs here. Minimalist housing should perhaps be less about technology and aesthetics, and more about the men, women and children who will live in them.